The evening begins at 6:30 PM. Dinner is served under the big blue Montana in the fields at Black Dog Farm. 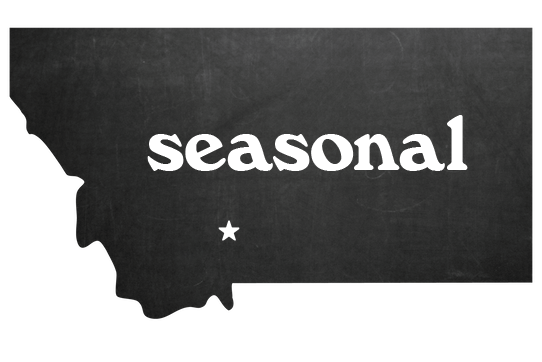 The menu is written by Chef Mel and the Seasonal Montana team and inspired by what is in season. All ingredients are sourced locally and from the farm. From I-90, take exit 330 onto HWY 10 West (coming from Bozeman, make a left. Coming from Big Timber, make a right). Continue on HWY10 for 2.5 miles to the traffic light. Make a left onto Park St.
At the next light, make a left onto 5th street and cross the railroad tracks. Make your next left onto Front St. After approximately 1.5 miles, continue onto Fleshman Creek Rd as you pass the cemetery. Once the road turns to gravel, continue for another 2.2 miles. The driveway is the first right after Trails End Rd. It is a common driveway and the farm is located at the end. Black Dog Farm is a small farm run by husband-and-wife team Tim Anthony and Kira Jarosz. Located on 30 acres just 2 miles from downtown Livingston, Montana, with stunning views of the Absaroka Mountains, Black Dog Farm focuses on pasture-raised pork, poultry (meat chickens and holiday turkeys) and egg production, with a small amount of grass-fed beef production. Our mission is to provide our community with local, humane, and delicious food while allowing our animals to express their natural behaviors, and using those behaviors to heal and regenerate our pastures. Tim & Kira started out with 4 backyard laying hens and have slowly expanded over the years. Tim is now a full-time farmer and Kira works part time as a veterinarian in Livingston. In addition to our pigs, cattle, chickens, and turkeys, our farm is home to 3 livestock guardian dogs who have kept our predator losses to zero, 3 house dogs, 6 cats, and a herd of Nigerian Dwarf goats. Please don't approach or talk to the livestock guardian dogs. They are very people-friendly, but can get worked up with a lot of commotion. The interior fence is safe, but the exterior perimeter fence and other temporary fences that may be in place are electrified.